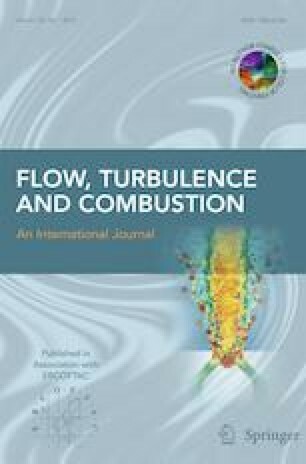 Automatized classification of turbulent flow is a challenging task, since turbulence is a phenomenon with highly varying parameters in space and time. In medical flow simulation, such a classification might be a key factor, enabling an easy and valuable comparison of patient data sets with respect to a wide range of sizes and shapes while addressing functionally similar processes. Within this study, two subject-specific geometries of the human respiratory tract are considered in a comparative flow characterization. Detailed Large Eddy Simulations (LES) of the respiration process (open vocal folds) are performed, incorporating individual geometric features based on head and neck CT imaging. Proper Orthogonal Decomposition (POD) analysis is followed by the calculation of the spectral entropy, a measure of the turbulence intensity. The flow field inside the respiratory tract shows transition from laminar (below the vocal folds) to turbulent flow (above glottis, inside larynx). This transition can easily be assessed based on the spectral entropy, as shown for the computed flow fields, and can capture variations in the local flow patterns. The present work proposes a measure to quantify the flow state based on the spectral entropy computed by POD. It is shown that this quantity can well be applied to characterize the flow state (laminar, transitional, or turbulent) in complex patient-specific geometries. The online version of this article ( https://doi.org/10.1007/s10494-018-9894-6) contains supplementary material, which is available to authorized users. The authors warmly acknowledge the fruitful discussions with Franziska Schulz.